Dimity Azoury, currently a coryphée with the Australian Ballet, remembers her grandmother with great fondness. She was a ballet student in Wellington, New Zealand, and even went on as an extra when the Ballets Russes companies visited New Zealand in the late 1930s. But, Azoury tells me, her grandmother’s parents thought that ballet was not an appropriate career for a young lady, which was not an uncommon attitude at the time. So her grandmother gave up her ambitions, married and moved to Australia. Azoury’s career as a ballet dancer, a career now (happily) considered a worthy course to take in life, moved another step forward just recently when he received the Telstra Ballet Dancer Award, worth the substantial amount of $20,000. 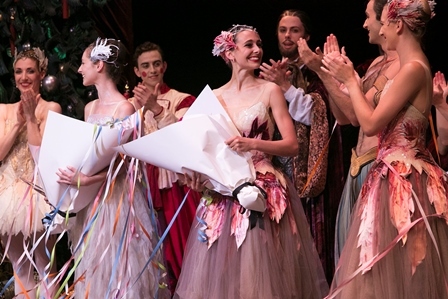 Her win was announced on stage at the Sydney Opera House at the final rehearsal for Sir Peter Wright’s Nutcracker. Azoury was trained first in Queanbeyan and then in Canberra at the Kim Harvey School of Dance. She was twice rejected for the Australian Ballet School but, encouraged by her parents and by Harvey, she auditioned again and was accepted in the 2005 intake. She spent three years at the school and was taken into the Australian Ballet in 2008. She is looking forward to the company’s production of Maina Gielgud’s Giselle, a highlight of the 2015 season, and has enjoyed rehearsing under Gielgud’s direction. Gielgud, Azoury says, knows exactly what she wants and so it is easy to find a clear focus in rehearsals. It has also been especially exciting for her to have the opportunity to try the role of Myrthe, Queen of the Wilis. There are also rumours that her much-loved deerhound, Gunther, may have a walk-on part in Act I. ‘I guess he’ll have to audition,’ she muses. In addition to regular company repertoire, since joining the company Azoury has also performed in every one of the annual Bodytorque programs, in which her fellow dancers try their hand at choreography. The year long journey as a Telstra nominee has proven to be an exciting one for Azoury. She looks back with particular pleasure on making the video each of the six nominees created as part of the year’s work. Azoury recently married Australian Ballet senior artist Rudy Hawkes. Her no-strings-attached Telstra award will most likely be spent on renovations to their house in North Melbourne.